The other night, I was feeling uninspired, so I decided to delve into my box of Project Life cards that I keep for just such an occasion. My random pick turned out to be a 3" x 4" card that was white in the center, bordered with thin strips of color: Bermuda Bay, Old Olive, Daffodil Delight, Tangerine Tango and Melon Mambo, ending with an outer layer of black. After inspecting this choice, and feeling even MORE uninspired, I set it aside. Lotta good THAT pick for inspiration did me, huh? The next day, I encountered my lonely little card sitting on my work table. I'm sure it was feeling unloved and neglected. Well, I couldn't have THAT, could I? I had instructions on how to do these cute photo corners, so chose a scrap of DSP containing a color I needed to match the card, and created four corners. I slipped them in place, but was not impressed. Do I keep that black edge??? With orange corners, does it look too Halloween-y?? I really debated cutting off the black border. But, I think my hesitation to do so led me to the right decision. Once I decided to retain the black border, the card came together readily. And I am, oh, so happy with the end result! I am so thrilled with the new Seaside embossing folder on page 195 of the catalog! You see, it measures 6" x 6" rather than the 4 1/2" x 6 3/16" of the normal-sized embossing folders. And do you know what that means? You can use a 4" x 5 1/4" piece of cardstock in it either vertically or horizontally! Yes! That makes the folder ever so much more versatile. If this folder is used horizontally, it gives the definite impression of "Seaside". But, if used vertically, as I did in my card, it gives more the effect of echoing the reeds and/or grasses at our goose's feet. Underneath the embossed white piece, I added a thin strip of black before adhering it to my Pool Party card base. There, now I have a trilogy of black. And I am HAPPY! 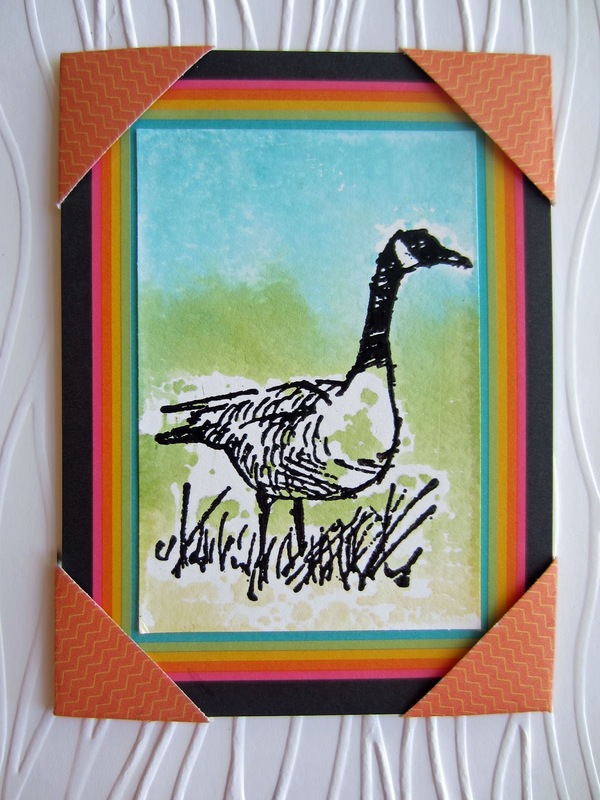 The beautiful stately Canada Goose from the Wetlands set fit within the white space perfectly. So, I cut a piece of Whisper White cardstock to 2" x 3" so it would sit right over the empty space on the card. I stamped the goose in VersaMark ink onto that piece and embossed him in black. Nice. Now, I'm bringing that black border into play! Now, I COULD have cut a mask of the goose and adhered it temporarily over my embossed goose for this next step. But, I opted to leave him unmasked just to see what I'd get. To create the variegated background, I took one of my acrylic blocks and scribbled in disorganized lines onto the block with the brush end of Stampin' Write Markers in Bermuda Bay, Old Olive and Daffodil Delight. 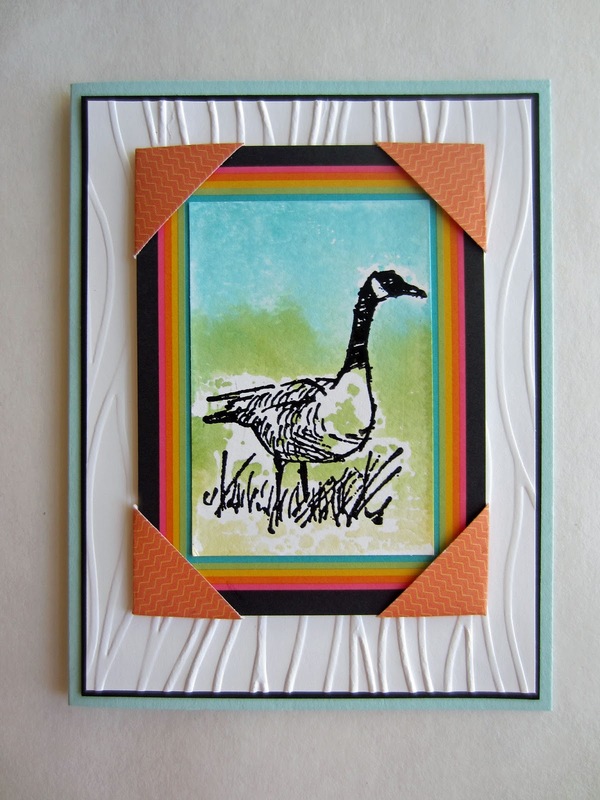 I then spritzed the block with water lightly and stamped the block right over my goose. Without masking him first, I got a few little blobs of the Old Olive on his belly. But, that's OK. I really like that effect. It seems to make him more incorporated into the design than against it. If you know what I mean? I love doing backgrounds in this fashion. You never get the same look twice. But, whatever results you get, it will never be wrong! Always always cool. Why don't I think to use this technique more often??? I love your work - simple yet totally complete. Thanks for sharing at the Pleasures of the NW's DIY party - and don't forget to leave a comment at the party! If you post gets featured, a comment gets it pinned and tweeted too! Living in Michigan on a golf course this project would look great hanging in my home! Thank you so much for linking at #overthemoon! I look forward to seeing what you share every week. Please come back for #WonderfulWednesday or #ThursdayFavoriteThings. Don't forget to comment your link #'s so I can be sure to visit and you get a chance to be featured! Pinned and shared. What's good for the goose... ;) So glad you linked up with us at #FridayFrivolity again! What a pretty card. It has color and texture with the pretty white background. I am loving the pops of orange too. Thank you for joining us at Sweet inspiration. Pinning.